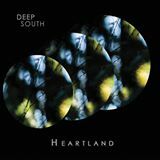 Skillan and Ledbetter’s Deep South brings “acoustic ‘trip folk’ with a hint of jazz, African groove and Nordic precision” to their latest Heartland album. And what a treat, just released on 1 October 2015 !! Multi-instrumentalist Dave Ledbetter and the percussive talents of Ronan Skillan (table, udu, percussion, didgeridoo, and hybrid kit) are adequately supported by several Swedish artists, with whom the two South Africans have worked over the years. Heartland offers hauntingly melodic compositions by guitarist Dave Ledbetter, all with a nordic acoustic twist of musical imagination. Recorded and co-produced in Bern, Switzerland, thanks to Swiss Arts Council (Pro Helvetia) supports, the artists include: Fredrik Gille on riq, frame drum, and percussion. He specialises in flamenco and Arabic percussion. Watch a wonderful display of his frame drum solo at https://www.youtube.com/watch?v=2wREUu1U_hs. Jan Galega Brönnimann on bass clarinet and Samuel Würgler on trumpet and flugelhorn and co-producer bassist Björn Meyer make up this stellar artist line-up. This album starts off with an engaging one-note strum in ‘Little Dan’ and moves with different rhythms from Ledbetter’s piano which becomes copied by his guitar. Ripples and waves of sounds ooze from flamenco castanets, Ronen’s percussions, back to that one note addiction, muted strings…. And that’s just the beginning! Those of us who have listened to Ledbetter over the ages will hear his familiar tunes, always performed differently depending on the ‘Spaces Between Places’, as this tune suggests. In ‘Harbour Intro’, I hear echoes of several depths of Ledbetter’s guitar which, for me, symbolizes looking at the calm ripples of sea waters at the shore, looking southwards. Sounds reverberate as they swing into ‘Harbour’ with Ledbetter’s joyful guitar. Percussions add that folksy element and move into poppish 4/4 beats. Ledbetter’s harmonic chords are rarely jarring. ‘Forest Road’ is named after a major road leading into central Nairobi. This sleepy ballad brings out the breathy bass clarinet of Jan Gelega Brönnimann which harmonizes with Ledbetter’s soft rhythmic scenes. How often do you hear a bass clarinet in folk/jazz? This is a favourite piece! Now that the listener has settled back and become very relaxed, the ear starts its journey towards realizing nirvana. The next tracks on this eclectic, soothing album, present soundscapes reminiscent of ‘nordic’ meditation, like in ‘Moonchild’, with a clear and crisp trumpet of Samuel Würgler. We move on to an Indian groove, ‘Awagawan’, which has a most unusual collaboration between Skillan’s didgeridoo with tabla overtones and Brönnimann’s whispering bass clarinet. This is just a whopping super treat on the album, plain and simple ! This Indian spiritual belief of Awagawan says that only good Karma can liberate us from The Wheel of Eighty-Four, or the cycle of ‘Awagawan’. The song is a tribute to the late, greatly missed Gito Baloyi who was murdered on the streets on Johannesburg, and was a stunning guitarist team member of Tenanas. It connotes the karmic birth and rebirth of style, form and sound, as well as deed, in our lives. Beware: don’t repeat actions which produce recurring sufferings in your lives! ‘Gone but Not Forgotten’ follows as the karmic journey continues. This is the longest song on the album, has lots to say, so one can easily meditate on the soft, slow nuances. Sometimes funereal, the wistful conversations between all four instruments hold attention and purpose. Listen carefully because towards the end, there’s a wonderful trumpet surprise. All is not forgotten! ‘Clovelly’ offers a bluesy jazz twist to this delightful song led by Ledbetter’s piano. Just when I thought my mind and spirit would have been cleansed of all evil karmic intentions, after the previous meditative offerings, along comes ‘Time Out’. Yes, I need that! This one’s for the body, I guess. Another slow, stereophonic tone poem which tunes the ear, certainly relaxes muscles, and celebrates with a higher registered bass clarinet, unique in all ways. This is acoustic at its best, a blend of jazz, folk, funk and blues across global spectrums! Highly reputable South African musicians join, like regular Deep South bassist, Shaun Yohannes, and JHB-based trumpeter Marcus Wyatt of ‘Language 12’. What could be better?